Dîner en Blanc - International - Le Dîner en Blanc – New Orleans celebrates its 5th anniversary! Le Dîner en Blanc – New Orleans celebrates its 5th anniversary! Le Dîner en Blanc – New Orleans marks a special milestone this year. The 2017 edition is the 5th one in the Big Easy! Cleveland Spears and Ronald Evangelista launched themselves into this amazing adventure 5 years ago. History says that back in the day, the state of Louisiana extended to the Canadian borders! It may have shrunk since then, but it has preserved some of its French roots including the historic French Quarter in New Orleans. Designed in the 18th century by a French architect, it is truly the soul of the city. With this French heritage in the bag, it is not surprising that Le Dîner en Blanc has found a wonderful home there. The idea of organizing the event in New Orleans came about when one of Cleveland close friends - now a veteran group leaders of New Orleans’ team - attended Le Dîner en Blanc – New York. He knew that it would be welcomed by the city and its inhabitants and that it would become a “Must Attend” event each year. He was right! In 2013, New Orleans joined the Dîner en Blanc International family – at the time, 9 North-American cities were hosting events.Throughout the years, guests of Le Dîner en Blanc - New Orleans have had the chance to enjoy a night under stars at the heart of some of the city’s most prestigious places like the New Orleans Waterfront, the gorgeous Spanish Plaza and the Mercedes Benz-Superdome. This year, once again, guests should be pleasantly surprised and charmed by the new secret location! • What is it about your city that embraced the concept so enthusiastically? New Orleans is a special place. Enriched with a bold, colorful, and diverse population, events like Le Dîner en Blanc easily fit into the robust, year-round, calendar of events. The elusive element to the location reveal, and the invitation only aspect, makes it desirable and it stands out as an event that you can't afford to miss. 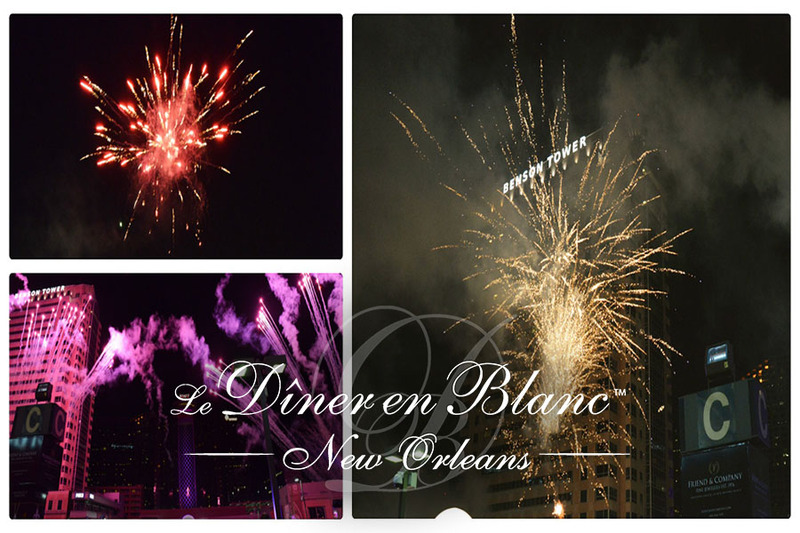 Anxious to offer their guests a quality event, they ensure that the visual aspect and the spectacular side of Le Dîner en Blanc are highlighted: thus in 2015 (and again in 2016), the sky of New Orleans erupted in a multicoloured firework display, over the astonished eyes of all. • How has Dîner en Blanc evolved in your city over the past five years? Where do you see it heading in the future? In 2013, 800 people were willing to take a chance on something new. In 2017, nearly 4,000 guests have registered to attend what is widely locally known as one of the years most sought after events. We have built a brand around Diner en Blanc - New Orleans, a brand that people love and identify with. We look forward to continuing the trajectory of growth; more members, better locations, bigger entertainment, more surprises and delight for everyone. Le Dîner en Blanc – New Orleans on Saturday, May 13th.